An electrical insulation is a material that reduces or prevents the passage of electricity from one conductor to another due to its high level of electrical resistance. Let’s read Ginnie’s essay about electrical insulation failure. The main purpose of insulation is to prevent any electrical shocks and reduce the possibility of any kind of electrical failures, making of is one of the most necessary aspects to take into account in the industry of electricity. 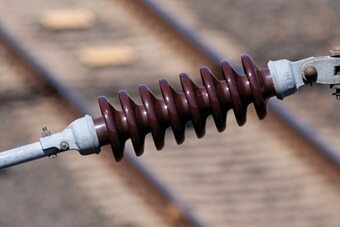 An insulator (See picture 1) refers to the insulating supports used to attach transmission lines to transmission towers used to suspend the cable without allowing the flow of current through the tower to ground. Designing power transmission and distribution lines requires to carefully select line insulators that must guarantee reliability under any normal condition, but insulators can fail in a variety of ways. The surface of insulators usually becomes polluted to some degree providing a path for current to flow causing failures in the system, that’s why insulator washing and cleaning is completely necessary. Also the unusual winds or ice load cause mechanical load to exceed it limits causing the insulating support to break. The transformer oil is a special type of oil which performs two important functions, as a coolant and prevents arching. The presence of contaminants and oxidization in transformer oil could cause partial discharges that will cause the deterioration of its insulation increasing the probability of failure of the transformer. Considering all these aspects, reliable transformer maintenance is fundamental for its operation. The way to test the oil to ensure it’s in good state is by performing a transformer oil testing which consists of taking a sample of the oil and measuring its breakdown voltage. Low breakdown voltage implies poor quality of the oil. Air is one of the most important insulation materials. All overhead transmission lines -and other electrical devices- take advantage of its properties to separate a high voltage conductor from another line or obstacle and so preventing from arching. The advantage of air over most type of insulations is that in case of failure, it quickly recovers its dielectric strength, making of it one of the most practical insulators. Air has a breakdown limit that should be taken into account while setting the minimum clearances of a transmission line or whatever the case may be, but environmental factors like humidity or pressure could lower the breakdown voltage, causing the insulation to fail under conditions it normally wouldn’t. or copy this trackback: http://engineering.electrical-equipment.org/safety/breakdown-voltage-what-happens-when-insulation-fails.html/trackback from your own site.